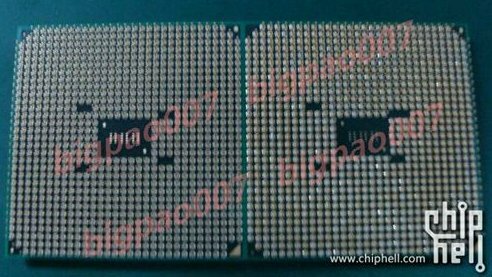 TechPowerUp found a side-by-side photo of AMD's FM1 and FM2 packages. The picture reveals these chips will be incompatible, as the pins don't match. Here is the first picture of AMD accelerated processing units in the existing FM1 package and future FM2 package on which the next-generation Trinity APU will be based on. Both packages are very similar, follow AMD's favourite yet archaic PGA design. The pins are physically arranged in a mostly similar fashion, though we don't have a pin map at hand. The difference comes with some of the blanked pins in the sub-central portion of the pin array. The FM2 package has 904 pins, compared to 905 on FM1. One pin is blanked, while a pair of blanked pins are arranged further away from the central cutout.